Eighty-two-year-old Samatul Mandal from Ula village of Howrah district belongs to a family of farmers who have been growing a rare variety of indigenous rice or folk rice variety (FRV)—Rani Akanda—for the past four generations. “The rice is very tasty, slender-grained and light,” says Mandal, as he shows us the family’s ancestral land of about half a hectare (ha). “My great grandfather had begun its cultivation nearly two centuries ago. We have kept the tradition alive,” says Mandal. He claims getting the same yield (4 tonnes/ha) as his forefathers, and that too, by using organic manure. He believes indigenous paddy can, to an extent, withstand climate change-induced aberrations in weather. But still there was scepticism about the prospect of FRVs. “Five years ago, when I started cultivating them on my 5 bighas of land (0.81 ha), my relatives called me mad,” recalls 43-year-old Parul Begum from Bhattadighi village of Uttar Dinajpur district. However, her family, which was growing a modern high-yielding variety (HYV) of paddy, was surprised to see the production of Bahurupi and Kerala Sundari, rice varieties native to Purulia district. “On an average, I raised about 700-750 kg per 0.16 ha as opposed to 550-650 kg under HYV production,” says Parul. Her story sends a message: organic FRV farming is cost-effective and sustainable. Parul is now a part of the Forum for Indigenous Agricultural Movement (FIAM) that works towards conserving indigenous seeds. According to Nadia-based Agricultural Training Centre, run by the West Bengal Agriculture Ministry, over 400 farmers from 11 districts took up FRV cultivation in 2016. Nearly 150 varieties were cultivated on more than 118,185 ha. At present, the training centre supports 26 FRV seed distribution centres. “Modern HYV paddy leads farmers to monocropping with uncontrolled use of pesticides and chemical fertilisers,” says Purnendu Basu, state agriculture minister. West Bengal, India’s leading rice producer, was witnessing gradual decline in crop productivity due to this. According to him, more than 90 per cent of over 5,500 traditional varieties of rice are now extinct because of HYV cultivation. In 2013, the agriculture department teamed up with farmers, NGOs and other states, including Assam, Jharkhand, Odisha, Kerala and Nagaland, to collect FRV seeds and promote their cultivation. Taking the mission ahead, Anupam Paul, Assistant Director of Agriculture (Training) at the training centre, has revived over 400 indigenous varieties of rice that were on the brink of extinction. It all began with a book—Loot Hoye Jai Swadesh Bhumi (Our Land Is Being Plundered)—written in Bengali by Debal Deb, a pioneer of folk rice movement in India. “I started seed conservation in 2001 by cultivating five FRVs through organic farming on one acre (0.4 ha) of land in the institute,” Paul reminisces. He got another 22 FRVs from various states and a seed bank—Vrihi Beej Binimoy Kendra—founded by Deb (then in Bankura; now shifted to Odisha). Paul’s collection of FRV seeds continues to grow, and so does his farm, which was declared a “Biodiversity Conservation Farm” by the state government in 2006. Out of 194 organic farms in West Bengal, this is the only one owned by the state. It has about 60 varieties of aromatic rice, 25 varieties of fine rice, 26 high-yielding varieties, 21 varieties that can thrive in deep water, along with salt-tolerant and rare varieties of red and black rice that are high on nutrients and antioxidants. Paul resisted the temptation of “creating” modern varieties of seeds by tampering with their genetic composition. “My objective was to retain the unique characteristics of rare rice varieties and revive them through propagation among farmers,” he says. He and his team reach out to local farmers through Krishi Mela (agriculture fair) and organic farming workshops where they are trained on procedures and benefits of FRV farming. Region-specific seeds are distributed among them. Nearly 1,050 farmers have visited the farm in 2016 alone. The folk rice movement started in Uttar Dinajpur in 2011 with a handful of farmers on about one hectare of land and 12 varieties of rice obtained from the training centre. Today, it has more than 65 members who cultivated 70 FRVs on a 9.2-ha land in 2016. “This time we hope to cover more than 100 bighas (16.2 ha). High-yielding FRVs such as Kerala Sundari, Kesabsal and Bahurupi, with their yield of 5-6 tonnes/ha, can well compete with the modern HYV that produces 4.5 tonnes/ha,” says Mousumi Basak, a member of FIAM. For Sudebi Mandal from Uttar Gobindokathi village of Sundarbans in North 24 Parganas district, FRV cultivation has been a source of sustenance as the soil in her region is salty and fields are inundated due to tidal waters. “After cyclone Aila hit Sundarbans in 2009, the modern salt-tolerant seeds couldn’t survive increased salinity of soil. It compelled us to explore FRV cultivation,” she says. Farmers now cultivate Kantarangi and Nico—FRVs that can thrive under such conditions. They are also experimenting with other FRVs—aromatic Kanakchur, Gobindobhog, Kaminibhog, Dadshal and Chinakamini—for the past three years. 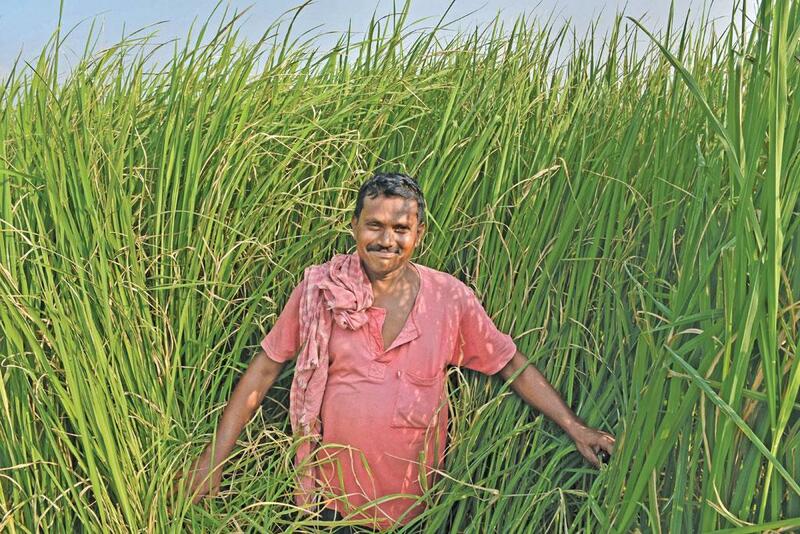 “Folk rice varieties fetch more profit as the cost of production is negligible, akin to zero-input farming,” says Bhairab Joardar, a farmer from the same village. According to Samatul Mandal, organic cultivation of FRV has ensured soil biodiversity by attracting earthworms and snails in the farms. Moreover, straw yield in organic cultivation is much higher. It is more palatable for cattle and better suited for thatched roofs as it takes three years to rot. Even though the FRV cultivation is catching up, farmers are sceptical about its sustainability as there is still no minimum support price (MSP) for FRVs. Discussions are, however, on with the Centre for fixing MSP for FRVs, especially Tulaipanji, Kalonunia and Gobindobhog. Steps are also afoot to acquire Geographical Index tags for these rice varieties. Addressing farmers’ concern over marketing strategies, Basu says, “Government is developing 186 modern agriculture markets across the state to enable farmers to sell their produce to a large number of consumers at a competitive price. 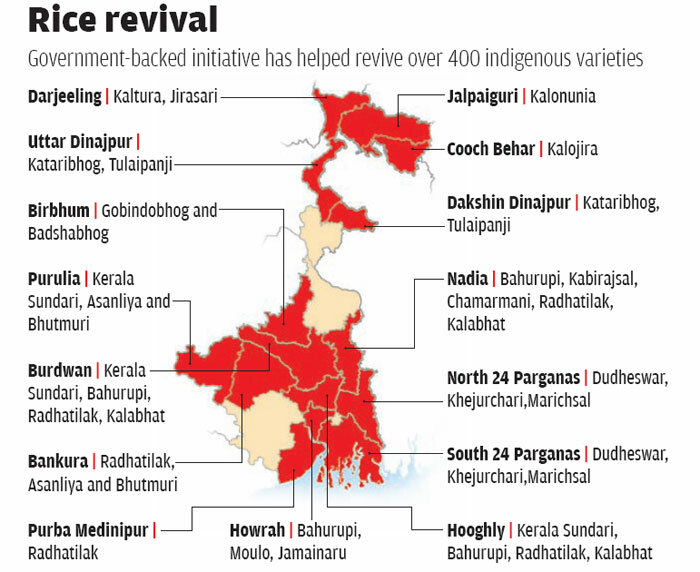 Of this, 60 are already functional at Singur, Pataspur and Bolpur.” Hopefully, the Rice Bowl of India will make a new mark soon! I am very glad for your kind post.